Page 03 is live! Sorry for the late update but I wasn’t sure if I should update the site now or wait until I get the site working in proper web comic format. I decided that I would rather post now and then go back and retro-fix these posts once Steve and I get the web comic layout working. 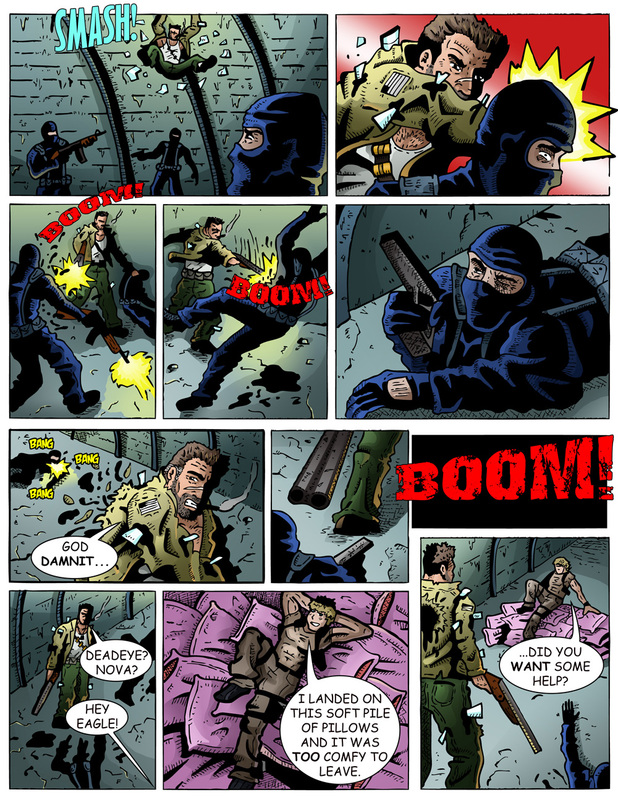 So page 03 was my first time drawing an action scene in sequence. I’m used to drawing just splash pages of action so to try and draw an action scene that has to also tell a story was an interesting challenge. I really wanted to showcase early on just how powerful Eagleheart is even when the other members abandon him. I’m still playing around with just how violent I want the comic to be. I want it to be action packed but I never want it to be too gory so that it can’t be shared with a younger audience. I originally played around with Eagle constantly getting limbs blown off and then having them be reattached in the next panel but that has yet to happen in any script so we will see. While I am posting Mission 001 I am also hard at work on 4(!) different Missions to Team Stryker. Mission 002 is being colored, Mission 003 has its cover being drawn, Mission 004 is being staged in rough pencils and Mission 005 is being scripted and plotted. There is never a dull moment in the life of Team Stryker for me or it’s members. Enjoy the rest of your week and I will see you back here on Monday! If you want to share it with a younger audience, which is best for this comic, then you’ll need to avoid profanity. I wanted to include a link to Team Stryker on my Wacky Monkeys site, but can’t for this reason. My site is an all-ages comic. I’m an elementary art teacher and my students are always reading my webcomic. As for the limbs being blown up, I think you can pull it off. Just have them break out the Band-Aids and reattach them that way. Good as new! Since the first issue I’ve dialed down the gore considerably. When I drew the first issue it was for a friend in his late 20’s and I hadn’t even considered making it into a webcomic at the time. Now I make blood really bright and over the top and save swearing for where it is more of a joke as opposed to swearing for the sake of swearing. Ha ha! Yeah, after reading through yesterday I came to realize that it’s best not to gear it towards kids, because you can do so much more with this type of comic. Like break tons of political correctness stuff.